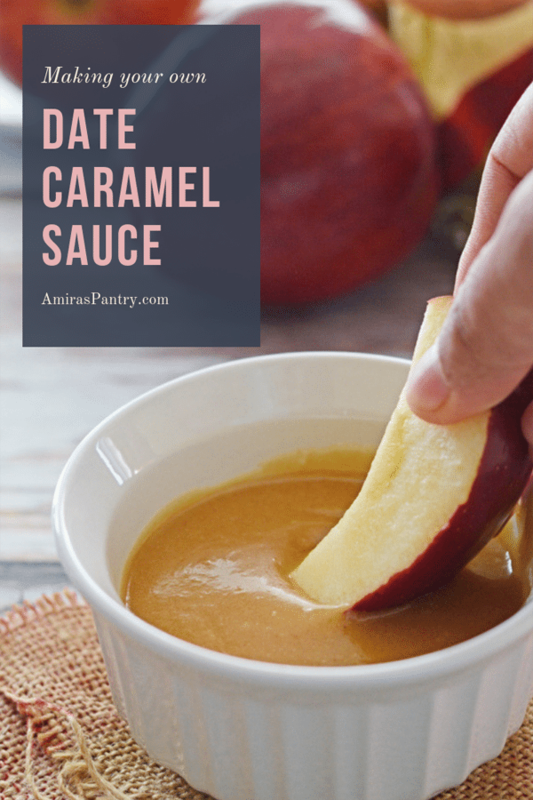 Easy caramel sauce without cream, a 3 ingredients date sauce that is rich and so creamy. When life gives you dates, this is what to do with it. Want to know what else to do with dates? try this chocolate covered dates. 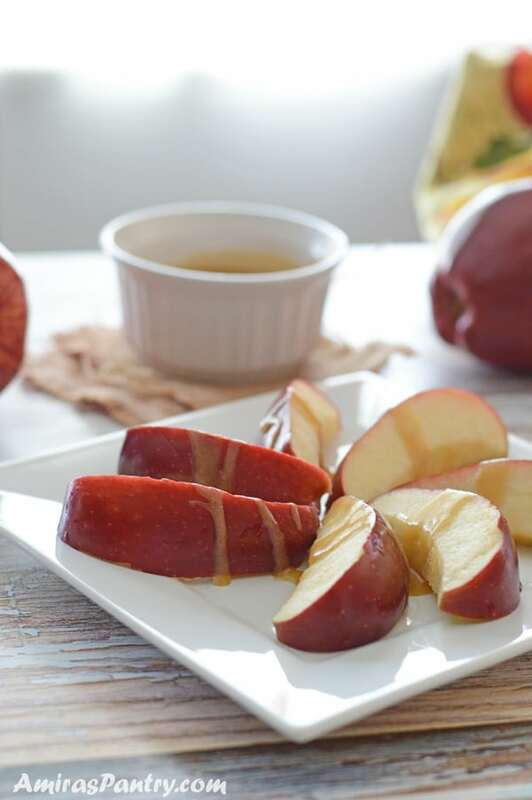 Silky sweet date caramel sauce super dreamy and rich that can be drizzled over anything. This date sauce is seriously addicting! It is not only the season of apples, pumpkins and spooky stuff. But also the season of caramel, I do not know why we even have a season for caramel?. 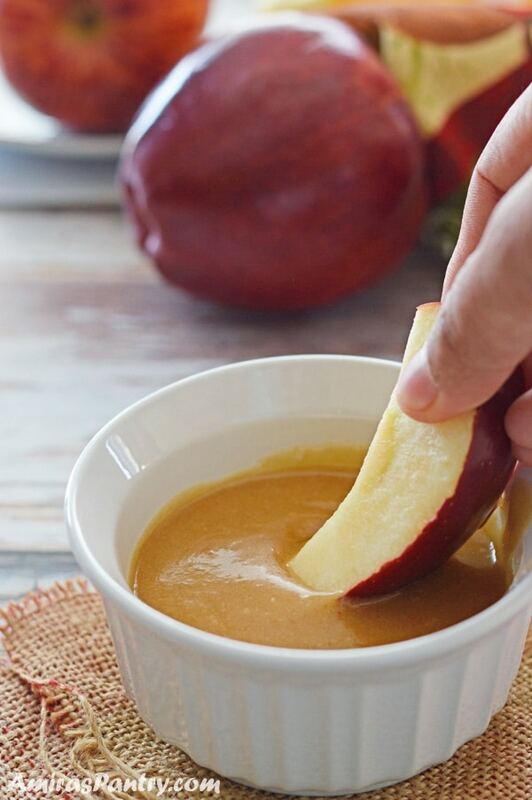 Caramel sauce should be honored and celebrated year round. I demand that. One of my kiddos just loooves sauces, ALL SORT OF sauces. From tomato sauce, pizza sauce, Alfredo, cream cheese, toffee … anything saucy and his is in. I call him my saucier and he inspires me to try new combinations in my recipes. Although he is as thin as a rake, he eats pretty much very well! When we were in Egypt this summer, I was making Koshary one day for the family and mom was surprised of how much tomato sauce I’ve used. But when she tasted the finished dish, she was happy with the thick, hot and bubbly sauce over her dish. So tasty. Best things in life happens accidentally, or shall I say pretty much without much planning. And this date caramel sauce was not planned for either!. I actually was experimenting with another recipe, will be up probably next week, when I thought of incorporating date in it. Then why not trying to make a date sauce.. I needed it buttery, fragrant and mildly sweet. Ta Da…. date caramel was born. 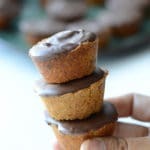 I searched the internet for a caramel recipe that has dates on it and I’ve found a couple of recipes that I’ve liked but needed something different. 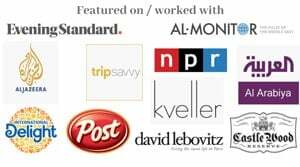 Although I would seriously be happy to be known as the first one who made/invented date caramel sauce, but this is not the case. 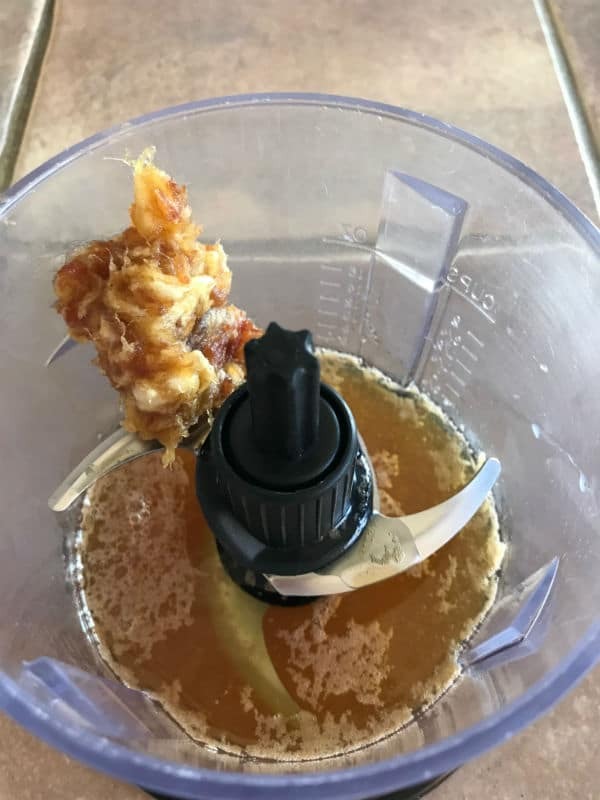 I wanted a recipe in which dates are cooked , you see cooked dates have an intense and unique flavor that you will not find anywhere else, especially when combined with butter… yumm. 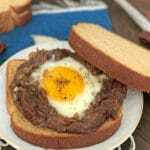 Have you tried this authentic recipe of eggs with dates? so delicious, you should try it some day to know what I am talking about. But when I cooked the date paste with the butter in this recipe, it yielded crunchy and not creamy caramel. To be honest, crunchy caramel was not bad at all, I loved it. But for my upcoming recipe, I needed a creamy one. So let me show you in details how to accomplish that. 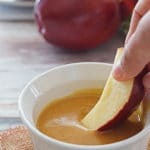 How to make date caramel sauce without cream? We’ll first melt butter in a saucepan then add the maple syrup. Use the best REAL, PURE maple syrup you can find. You can definitely use salted butter for a salty variation or simply sprinkle some sea salt on the finished sauce. My kids though, do not like sea salt caramel as much hence I skipped this additional step. When the mixture boils, reduce heat to a minimum of the minimum and continue stirring and simmering for ONLY one minute. Aaand when I say one minute, I seriously mean exactly one. Use your kitchen timer, stove timer, watch, cell phone …. whatever I do not care just time yourself right pleaaaase. Turn off the heat, and pour the mixture in your chopper, food processor, blender or whatever. The reason we pour it over immediately in another vessel is to stop it from cooking any longer. If we leave it in the pan it will continue to heat up using the heat from the pan itself. Wait for like 5-7 minutes, depends on the temperature of your kitchen, we do not want it to get cold but not extremely hot or we will end up with some crunchy pieces of cooked date paste. Now add the date paste and mix, mix ,mix so the paste will be very well incorporated in the butter/maple mixture. You’ll have the quickest, most amazing, magical date paste. For a complete vegan one: use coconut oil. For different flavors: try adding vanilla, cinnamon, cloves, pumpkin pie spice …. and so on. Also you might want to try browning the butter for a brown butter date sauce. How to use date caramel sauce? As a sweetener for your coffee. 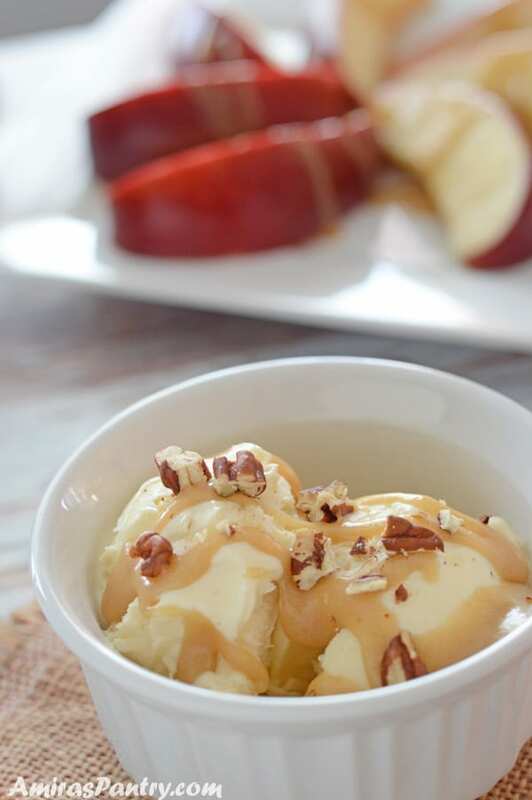 Or , my favorite, straight by the spoonful from the jar as an after dinner sinful dessert . This is seriously magical . I kept licking everything while taking photos and it was super hard to wait. A final note, if you cannot find real maple syrup or if it is too expensive at your area, you are welcome to use honey you can also use agave but it will be a little bit sweeter. 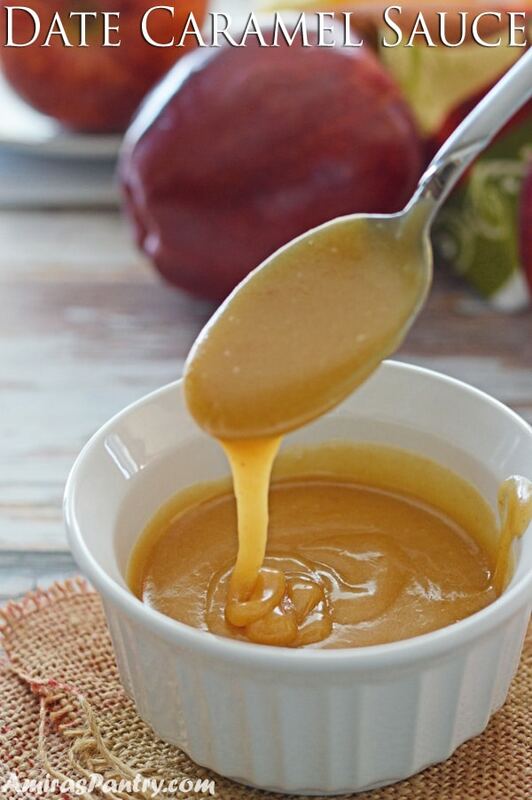 A creamy, soft 3 ingredients heavenly good caramel sauce, for just about anything in your life. 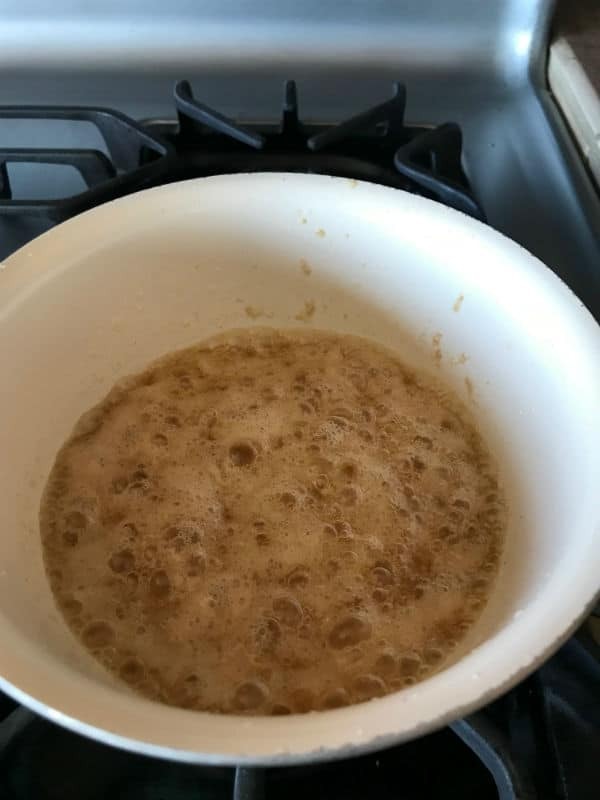 In a small saucepan over medium low heat, melt butter then add maple syrup. Mix well and heat on low for 1 minutes. Pour the syrup in a small blender bowl, I’ve used my chopper bowl. Let it cool down for 5-10 minutes. Add the date paste and mix well. 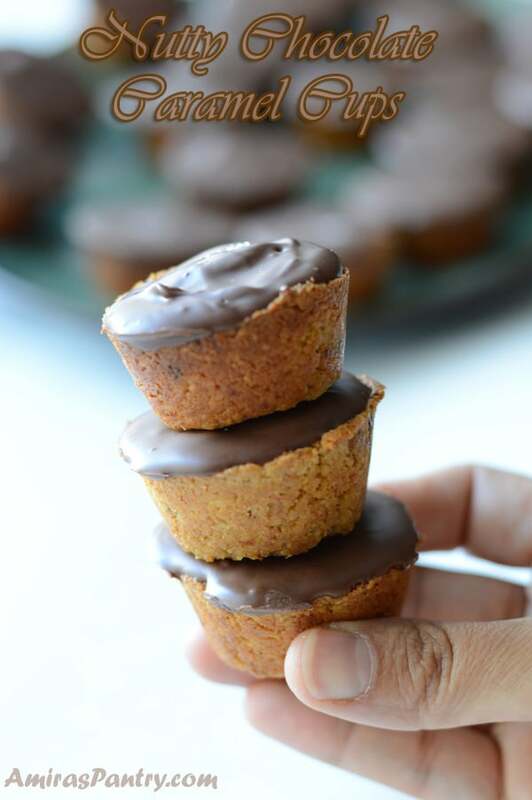 * You can use coconut oil for a complete vegan caramel. ** If you cannot get a hold of pure maple syrup or if it is too expensive in your area, honey would work nicely too. Brown rice syrup works well but the taste gets a little funky. Agave would probably work as well but will be a little sweeter. 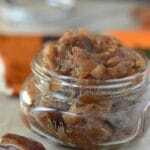 *** Here is the link for date paste —> https://amiraspantry.com/date-paste-agwa/ or simple soak some dates in hot water for about 15 minutes then peel, take the seeds off and smash a bit. 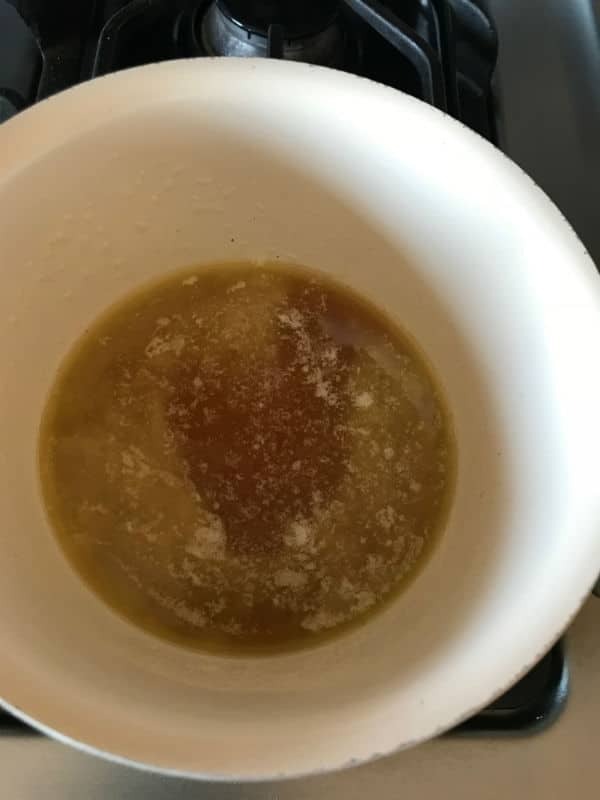 **** I haven’t tried refrigerating the caramel, I just kept it for 4 days at room temperature but I would say a week at most, it hardened a bit, but nothing that a quick round in the microwave could not fix. However, I highly recommend making it and then serving immediately, it’s the right consistency at that point. Gosh! This looks so good and love how you used dates in it. Fabulous indeed! Thanks dear, it is so delicious. I’m sure you appreciate dates more now after your Dubai stay :).I hope you’ll give it a try. Amira, your caramel sauce sounds decadently delicious. We love caramel, and eat it throughout the year. But much more in the fall for some reason! So I guess maybe it is caramel season. 🙂 Anyway, love this! Really. Good. Stuff. Thanks! Caramel is heavenly food so delicious with anything. 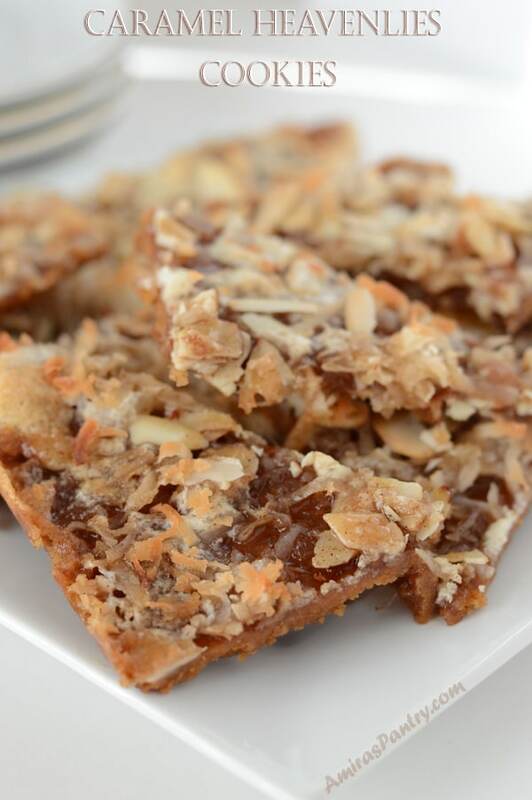 Being a caramel fan, I hope you’ll try this recipe . Thanks John.